“The PA’s policies prevented many families from the chance to celebrate Ramadan with their kids who are in their jails, especially students from al-Najah and al-Quds universities,” the bloc said in a statement. Several students who are affiliated to the Islamic bloc were detained by the PA three weeks ago during activities in solidarity with hunger-striking prisoners. The Fatah detainees in Gaza started a hunger strike on Monday demanding their release, according to a Fatah statement. “The so-called Hamas prisons services suppressed Fatah political detainees and sent them to cells as a punishment for their strike,” Fatah said in a statement noting some had been in jail for five years. Fatah demanded the immediate release of its political detainees who have been in Hamas jails. 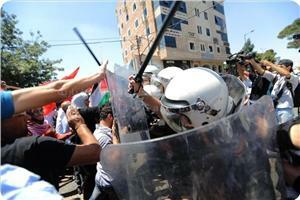 Two Palestinian youths were stabbed to death early Monday in Ramallah and Jericho, Palestinian police said. 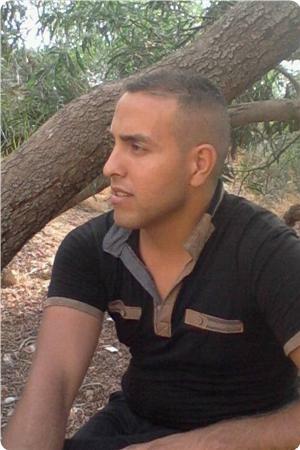 Muhammad Youssef Khamis al-Hajj, 22, was stabbed to death in al-Amari refugee camp in Ramallah during a fight with another youth, police said. Police arrested a suspect at the scene. Azmi Muhammad Shaker Muhanna, 34, was stabbed to death in Aqaba refugee camp late Sunday. Palestinian demonstrators argue with PA riot police during a rally in solidarity with hunger strikers in Israeli jails, in Hebron on 20 June. 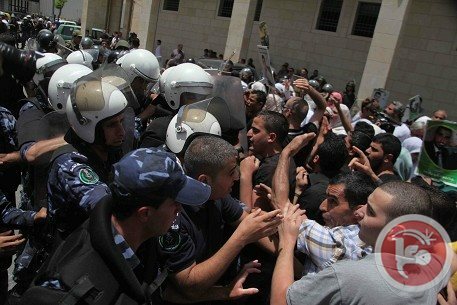 Riot policemen Friday assaulted on journalists as they were to hold a sit-in at the al-Manara square in central Ramallah, confiscated their equipment, broke their cameras and briefly detained some of them. According to Ali Abunimah, a co-founder of and blogger for Electronic Intifada (EI), among the attacked was a CNN crew, whose camera was broken. Lama Khater, a writer, told Wattan TV that people gathered at a mosque after Friday prayers to rally in support of Palestinian prisoners in Israeli jails as well as against the violent Israeli assault on Hebron over the past week, reported the EI. Some 125 Palestinian prisoners have been on hunger strike in Israeli jails, protesting their detention without charge or trial. Palestinian security services on Friday prevented a march supporting prisoners in Hebron from taking place, participants and onlookers reported. Security services prevented a march that was called for by the Palestinian Prisoners Center for Studies to support hunger-striking prisoners in Israeli jails. Security services prevented journalists from doing their jobs, a journalist told Ma'an. An employee of a US-based news network told Ma'an that the security services beat reporters "savagely" and broke at least one camera. 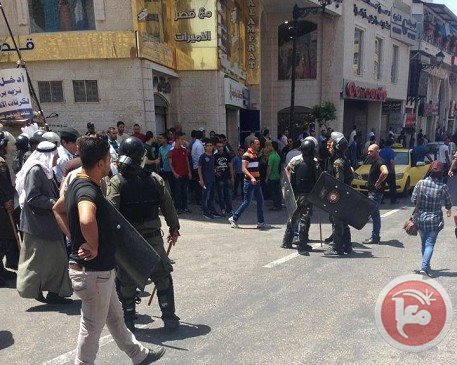 The Palestinian Prisoners Center for Studies condemned the security service for preventing the march. The governor of Hebron has updated the prime minister on the incident, informed sources said. Hamas on Thursday lambasted Palestinian president Mahmoud Abbas for his cooperation with Israeli forces as a massive search operation for three missing Israeli teenagers across the West Bank enters its second week. Hamas spokesman Sami Abu Zuhri said that security coordination with Israel "is a crime and a violation of the Cairo agreement which stated that security cooperation is punishable by law," referring to an earlier reconciliation agreement between Fatah and Hamas. The sharp denunciation of the security coordination between president Abbas and Israel during the daily military raids came a day after the Palestinian Prisoner's Society said that the number of detained had topped 300, more than two-thirds of whom are Hamas members. Abu Zuhri also called on Egypt to commit to its responsibilities as the sponsor of the prisoner exchange deal in 2011 that exchanged Israeli soldier Gilad Shalit, after Israeli forces detained dozens of those freed in the deal. Egypt oversaw the deal, and has already demanded Israel end its arrest campaign across the West Bank. Abu Zuhri, in a press conference in Gaza, also warned against any possible Israeli attempt to exile Hamas leaders and lawmakers, saying that the Israel had previously tried it and failed, and saying that any attempt to exile the detainees "will open the gates of hell on the occupation." Abu Zuhri reiterated that resistance, in all its forms, is a right for Palestinians in order to free their lands and holy sites. Abu Zuhri also condemned President Mahmoud Abbas’' comments during an Organization of Islamic Cooperation meeting in Jeddah on Wednesday, in which he criticized the kidnapping of the three Israeli youths from a Jewish settlement in the occupied West Bank. "We condemn President Abbas shocking comments, which do no represent Palestinians or the martyrs and prisoners of Fatah. Those who give up on the Intifada only isolate themselves," he added. "Intifada is the greatest phenomena in our modern history," he added, saying: "It is renewed whenever pressure and aggression are increased on our people." Hamas slammed President Mahmoud Abbas' support for security coordination with Israel on Wednesday, as Israel pursued a manhunt for three teens believed to have been kidnapped last Thursday. "President Abbas' statements on security coordination with Israel are unjustified, harmful to Palestinian reconciliation ... and a psychological blow to the thousands of Palestinian prisoners suffering a slow death in the occupation's jails," Hamas spokesman Sami Abu Zuhri said. "These statements are based solely on the Israeli narrative, without presenting any true information," Abu Zuhri added. His comments came after Abbas said security coordination with Israel was in the Palestinians' "interest" and pledged there would be no new intifada, or uprising. "Those who kidnapped the three teenagers want to destroy us. We will hold them accountable," Abbas told an Organization of Islamic Cooperation meeting in Jeddah. "The three teens are human beings like us and they should be returned to their families," he added. Abbas said he would be willing to start a new round of negotiations for 9 months if 30 veteran Palestinian prisoners detained before the Oslo Accords were released and Israel froze settlement construction for three months. Any such talks should focus on agreeing on borders, he said, adding that the PA has been in contact with US officials about resuming talks. Israel used the reconciliation deal between the PA and Hamas to foil peace talks, he added. 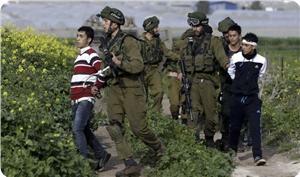 Since the teenagers disappeared on Thursday evening, Israeli troops have arrested some 240 Palestinians, mostly Hamas members, in mass raids across the occupied West Bank. So far, there has been no formal claim of responsibility, and Hamas has dismissed Israel's accusations as "stupid." It was Hamas' sharpest criticism of Abbas since the Islamist movement signed a unity deal with the PLO, which is dominated by Abbas' Fatah party, aiming to end seven years of rival administrations in the West Bank and Gaza Strip. Israeli Prime Minister Benjamin Netanyahu has urged the international community to press Abbas to end his reconciliation deal with Hamas, citing the kidnapping as proof the movement's "terrorist" activities make it an unsuitable political partner. On June 2, Abbas appointed a unity government made up of independents, which is committed to renouncing violence. “Israeli mass-abduction campaigns will neither succeed in thwarting our resistance path nor to get in the way of our commitments towards the Palestinian cause and people,” the Islamic Resistance Movement, Hamas, in al-Khalil said in a statement on Tuesday. “Such a ferocious campaign targeting the Palestinian people and Hamas leadership is not the first of its kind. We, Palestinians, have seen it all ever since the Israeli invaders laid claim to our soil. 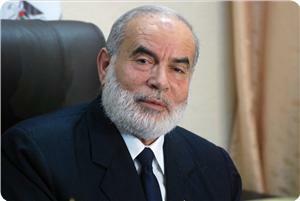 Yet, we strongly believe that victory shall come by soon and will always cling to our inalienable rights,” Hamas added. A wave of abrupt raids has been instigated over the past few days by the Israeli Occupation Forces in al-Khali and other provinces of the West Bank. Cities, towns, villages, and refugee camps that were all cordoned off by the heavily-armed Israeli patrols. Scores of Palestinian civilians, activists, and Hamas leaders were rounded up and the entire West Bank has been raked through in search for more preys. 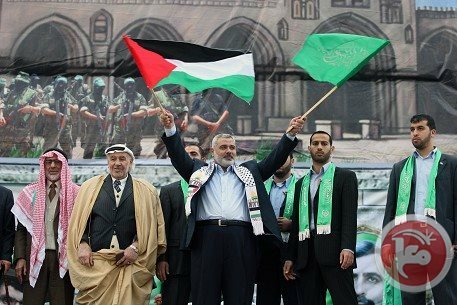 “Hamas’s power is not sized up by the dozens, hundreds and even thousands of people affiliated to the movement; it is a whole stream that is deeply ingrained and propagated across our blessed soil,” Hamas declared as it hailed the Palestinian masses who have stood by the abducted citizens and made proof of an unbreakable eagerness to face up to the Israeli conspiracies. Hamas called on the Palestinians to never lose track of the prisoners’ cause and to keep on supporting the hunger striking prisoners in Israeli jails. The Islamic Movement further urged the PA security apparatuses to release all political detainees and halt its bullying procedures against Palestinian activists. “Let us all unite to take the bull by the horns, bolster our internal cohesion, keep to our sole goal of confronting the occupation, and back up our prisoners throughout,” Hamas appealed. Hamas has condemned the detention of one of the party's leaders by Palestinian Authority security forces in the West Bank, stressing the political nature of the charges. Hamas spokesperson Fawzi Barhoum said in a statement that the charges against Nazih Abu Awn by the Nablus Magistrates Court were "stressing," adding that "they aim to ruin Hamas' reputation and are an extension of political, security and media campaigns that target Hamas in the West Bank." Barhoum also demanded that "Nazih Abu Awn be released immediately along with all political detainees in the West Bank," calling for an end to "campaigns that target reconciliation and national unity and instead activities in support of prisoners in Israeli jails." West Bank security forces detained Sheikh Nazih Abu Awn and a number of other Hamas supporters who had gathered to welcome ex-prisoner Ibrahim al-Aqra in Nablus on Monday. A day before, PA forces arrested 16 Hamas members. The detentions threaten to disturb the atmosphere of reconciliation between the two largest Palestinian political parties that has followed after a national unity deal was signed on April 24, ending seven years of political division. In mid-May, the reconciliation-related Freedoms Committee expressed concern that PA authorities in the West Bank continued to arrest individuals for politically-motivated reasons, specifically targeting Hamas. Hamas leadership slammed the attacks launched by the security apparatuses of the Palestinian Authority (PA) on women and MPs, including Hassan Youssef, Fathi Kar’awi, along with the Hamas leader Sheikh Nazih Abu Oun, while participating in rallies in the West Bank in solidarity with the Palestinian hunger strikers. The attacks, which coincide with an upsurge in Israeli assaults on Palestinian deputies, bode ill for the reconciliation ambiance, First Deputy Chairman of the Palestinian Legislative Council, Dr. Ahmed Bahar, said in a statement. Bahar called on the PA chairman Mahmoud Abbas to assume his responsibility vis-à-vis the assaults and form a special committee to investigate the background of the attacks. Such attacks targeting the Palestinian peaceful protestors, including women, bear witness to the seriousness of the security coordination and display a striking apathy regarding the prisoners’ cause, Dr. Sami Abu Zuhri, Hamas spokesperson, maintained in an exclusive statement to the PIC on Tuesday. The attacks culminated in the assault launched by the PA security forces on the wife of prisoner Jamal Al-Tawil, her daughter Bushra, a journalist, and her sister Intissar. The incident is a reminder of the PA attack on prisoners’ wives, including the wife of the Palestinian leader Abbas al-Sayed, just a few days ago. Six more youngsters affiliated with Hamas were also targeted and kidnapped. Muhamad Ata was brutally beaten on his head and rushed to hospital after he fainted. MP Fathi Kar’awi was rounded up during a solidarity march in Tulkarem. The attacks were carried out as Hamas members and other non-violent protestors performed evening prayers in the solidarity tent set in Abdel Nasser square. Hamas leader Sheikh Nazih Abu Oun, 53, along with other Hamas members, were rounded up by the PA forces while they gathered to welcome ex-detainee Ibrahim al-Akra’ in Nablus after 17 years in prison, a PIC news reporter documented. Ex-detainee al-Akra’ has called the Palestinian leadership to take serious action and appeal to international courts so as to expose Israeli crimes against the prisoners. 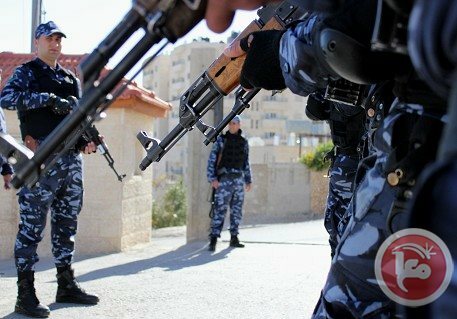 41 Palestinian citizens have been rounded up by the security apparatuses of the Palestinian Authority (PA), with no prior authorization or notice, during the first week of June, the Euro-Mediterranean Network for Human Rights documented while raising alarm bells over the remarkable upsurge in PA’s attacks on non-violent protesters. Scores of Palestinian civilians were arrested as they joined peaceful demos staged in solidarity with the Palestinian hunger-striking detainees, who have been starving for 46 days in a row, Euro-Med reported in a statement, published on Facebook, on Sunday evening. Torture affidavits and appeals have also been on the rise during the past few days. Some captives were rushed to hospitals throughout. Euro-med spoke against PA’s arrest of a Palestinian journalist in Tulkarem while he tried to ensure an authentic coverage of a protest rally. Dozens of non-violent demonstrators, including women and children, were targeted with heavy beatings and assaults by the PA forces. The Euro-Med called on the PA to observe all the terms of the international conventions signed lately, ensuring the rights to peaceful protests and rallies and outlawing arbitrary arrests and violence. In a related event, peaceful sit-ins were staged on Sunday evening in al-Khalil by dozens of the Kufaisha family members in protest against PA’s arrest of Anas, son of the hunger-striking detained MP Hatem Kufaisha. According to Anas’s mother, the PA confiscated the car driven by the son and his cousin before dragging them both to the intelligence headquarter, claiming the detainees will be released within 24 hours. She said that hundreds of the family members vowed to stand firm and called on the freedoms committee and human rights institutions to urge the PA to free their sons. The PA had already kidnapped Kufaisha’s sons-in-law, Raafat and Raef, two days ago, and extended their detention periods, despite a court rule stipulating their immediate release. Hamas Movement strongly condemned PA forces' attack on Palestinian prisoners' mothers, sisters, and wives during their participation in a solidarity march in Tulkarem on Friday evening in support of hunger strikers in Israeli jails. Eight Palestinian women were brutally beaten and attacked by PA forces including the hunger striker Abbas Sayed's wife Ikhlas al-Souwis in addition to other hunger strikers' wives and mothers. The movement praised Palestinian martyrs and prisoners' families for their sacrifices and legendary steadfastness. Hamas called on head of the unity government Dr. Rami Hamdallah to take action and hold those responsible for the attack accountable and to immediately release all political prisoners in PA jails. The Islamic movement called on rational men to intervene and to put an end to political arrests in the West Bank, and called on the citizens in Tulkarem to stand together and to protect martyrs and prisoners' families. 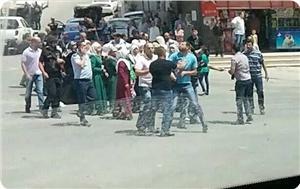 The attack took place when PA forces brutally suppressed a peaceful march heading towards General Intelligence Service headquarters demanding the release of the activist in prisoners' issue Islam Riad Badir. 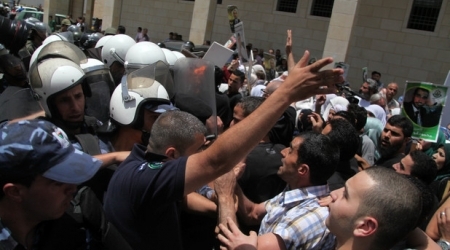 Mass arrests were carried out during the attack including Aqsa TV cameraman Ahmad Khatib. Ikhlas al-Souwis, the wife of Abbas Sayed who is sentenced to 35 life imprisonment terms in Israeli jails, confirmed that she was exposed with a number of prisoners' wives and mothers to a brutal attack by PA forces during their participation in a peaceful march against political arrests. Al-Souwis said that PA forces attacked and assaulted the women taking part in the march, tore the garments of some of them and took off the veil of one of them. PA forces also attacked and arrested Aqsa TV cameraman Ahmad al-Khatib after confiscating his equipment in order not to broadcast the attack. She held Palestinian Authority Chairman Mahmoud Abbas and Prime Minister Rami Hamdallah fully responsible for the attack. Sayed's wife also called on Hamas and resistance factions to intervene and to put an end to political detention policy in West Bank. 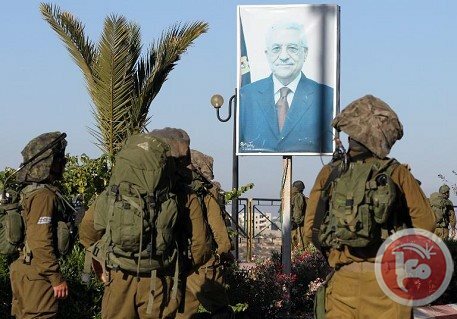 Despite reaching Palestinian reconciliation agreement on 23th of April, PA forces continued their political arrest campaigns and attacks against Hamas's supporters in the West Bank. Ibrahim Abul Reesh, a 25-year-old youth from Nablus, was transferred to a Nablus hospital on Friday night ten days after his detention in a PA preventive security jail. Family members told the PIC reporter that the preventive security apparatus blocked family visits to Abul Reesh, who was reportedly transferred to hospital with internal bleeding. They said that even his wife and mother were not allowed to visit him, adding that they heard of his condition from hospital staffers. They said that Abul Reesh, a liberated prisoner, was arrested on 26/5 while participating in a human chain in Nablus organized in support of prisoners. The preventive security said that it was going to release him half an hour later, they added. The family held PA chairman Mahmoud Abbas and the preventive security apparatus legally responsible for any harm done to their son.